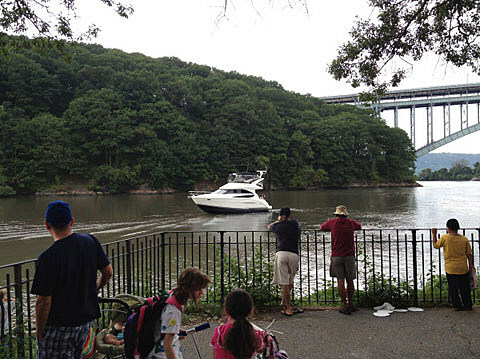 Comedian Louis “C.K.” Szekely, known for his comedy routines and TV shows “Lucky Louie” and “Louie,” had his Labor Day weekend joy ride on a yacht cut short when the boat got stuck in the mud off the Harlem River in Inwood Hill Park., according to law enforcement sources. Photo via the Inwood Community Group on Facebook. Louis CK recently played three shows at the Bell House, and isn’t playing ATP, but is playing lots of other upcoming shows.